Before you leave, please make sure to sign the Haibane Techou. John's Haibane-Renmei Shrine - The first Haibane fansite I believe. Contains excellent information about the doujin the anime is based upon. PLDC's Official Haibane site - Contains brief background information, character introductions, and merchandise info (Japanese). Haibane Renmei - French Haibane fansite with excellent info. Haibane Renmei Shrine - One of the more complete English-language Haibane fansites. 灰羽の庭 [Haibane Garden] - Fansite with basic info and chart of the sign language used in the show (Japanese). Within the Wall - English-language Haibane Renmei fansite. 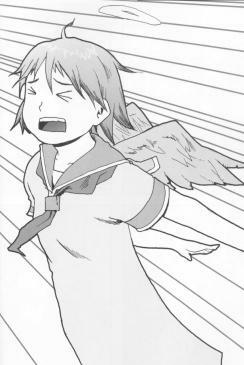 Sekai no Hajimari - English-language Haibane Renmei fansite with in-depth symbolism analizations. Anime Tempy - Anime review site owned by the sweet and cuddly Tempy. JASCII - Special thanks to Jascy for helping me figure out some of the little things and also the romanization of the songs. Feel free to link at your leisure. You may use either of the two images below or a text link. It doesn't matter.